Process measures look at the efficacy and timeliness of care. This includes how well hospitals provide patients with the best standard of care for common conditions or surgical procedures, how quickly hospitals treat patients with medical emergencies and how well hospitals provide preventive services. 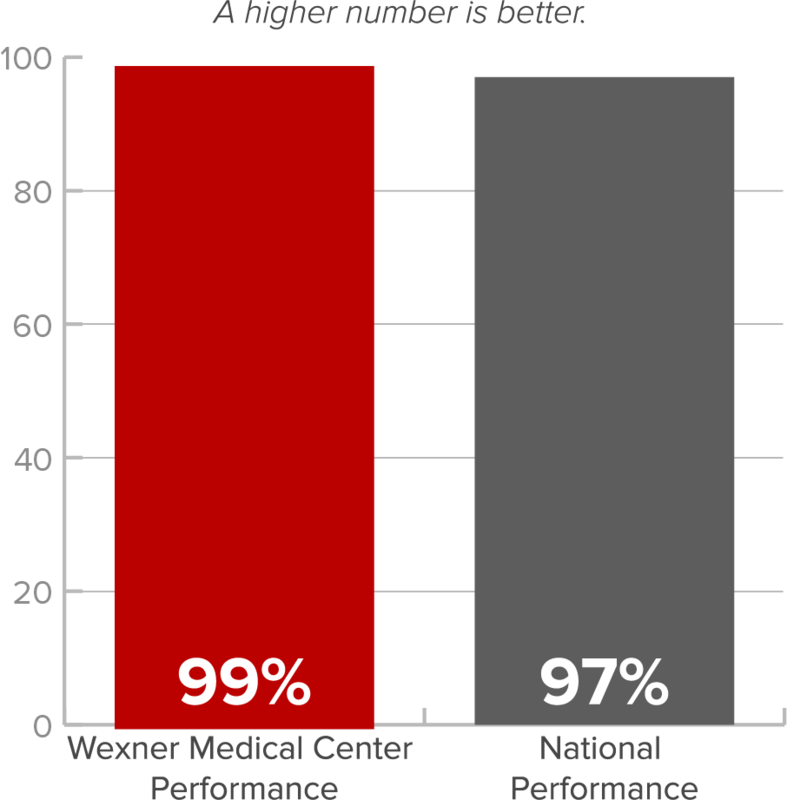 Wexner Medical Center scored above the national average in 13 of 18 measures including surgical, stroke and leg/lung blood clot care. We are working to improve our scores the other areas which are all related to reducing wait times for patients in the emergency department. 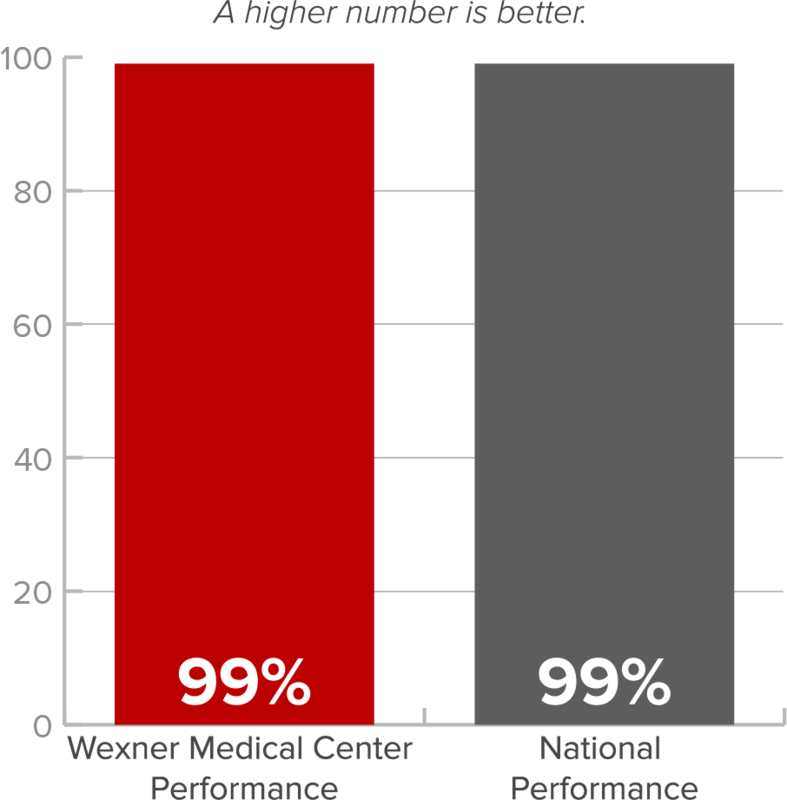 Venous Thromboembolism (VTE) Prophylaxis 99% 99% Patient receives medication in the hospital that helps prevent blood clots. Discharged on Antithrombotic Therapy 100% 99% Ischemic stroke patients who received a prescription for medicine known to prevent complications caused by blood clots at discharge. Anticoagulation Therapy for Atrial Fibrillation/Flutter 99% 99% Ischemic stroke patients with a type of irregular heartbeat who were given a prescription for a blood thinner at discharge. Thrombolitic Therapy 100% 97% Patients whose strokes were caused by a blockage in the blood supply to the brain (ischemia) who got medicine to break up a blood clot within 3 hours after symptoms started. Antithrombotic Therapy by End of Hospital Day 2 97% 98% Ischemic stroke patients who received medicine known to prevent complications caused by blood clots within 2 days of hospital admission. 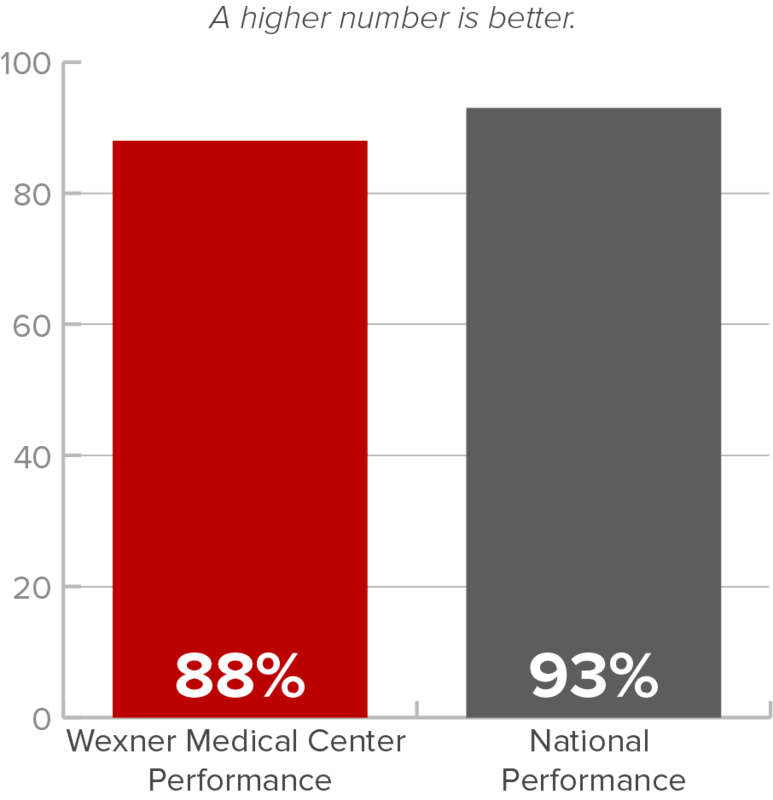 Discharged on Statin Medication 99% 99% Patient is sent home taking medications that help reduce bad cholesterol levels. Lower bad cholesterol levels can reduce the risk of future stroke. 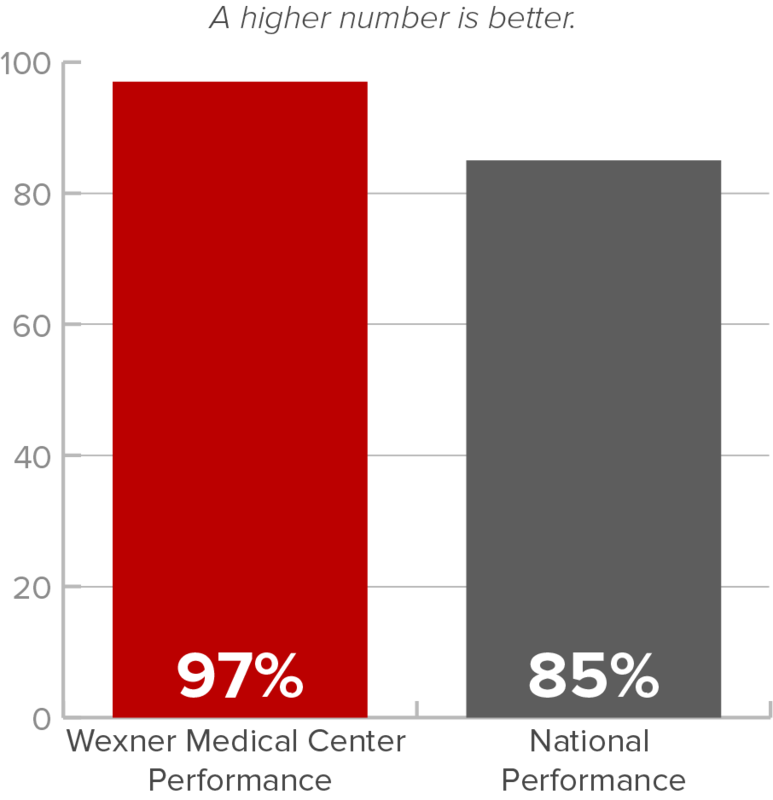 Stroke Education 99% 97% Ischemic or hemorrhagic stroke patients or caregivers who received written educational materials about stroke care and prevention during the hospital stay. Assessed for Rehabilitation 100% 99% Ischemic or hemorrhagic stroke patients who were evaluated for rehabilitation services such as occupational and physical therapy. Venous Thromboembolism (VTE) is a serious blood clot that can occur deep in a vein in the lung or leg. If the blood clots become dislodged, they can travel through the circulatory system and cause a heart attack or stroke. 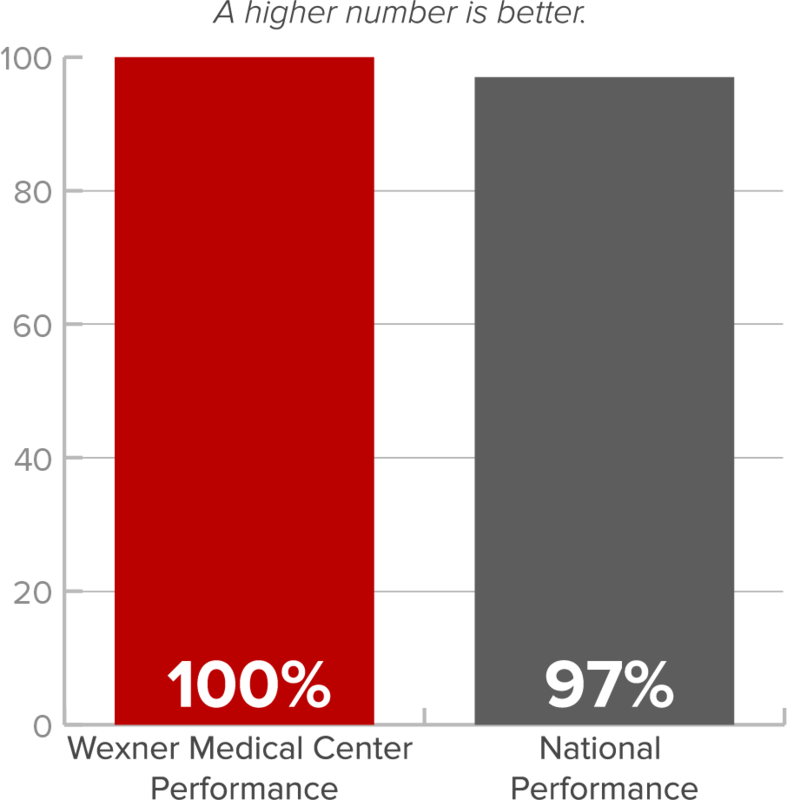 Venous Thromboembolism Warfarin Therapy Discharge Instructions 97% 93% Patients with blood clots who were discharged on a blood thinner medicine and received written instructions about that medicine. 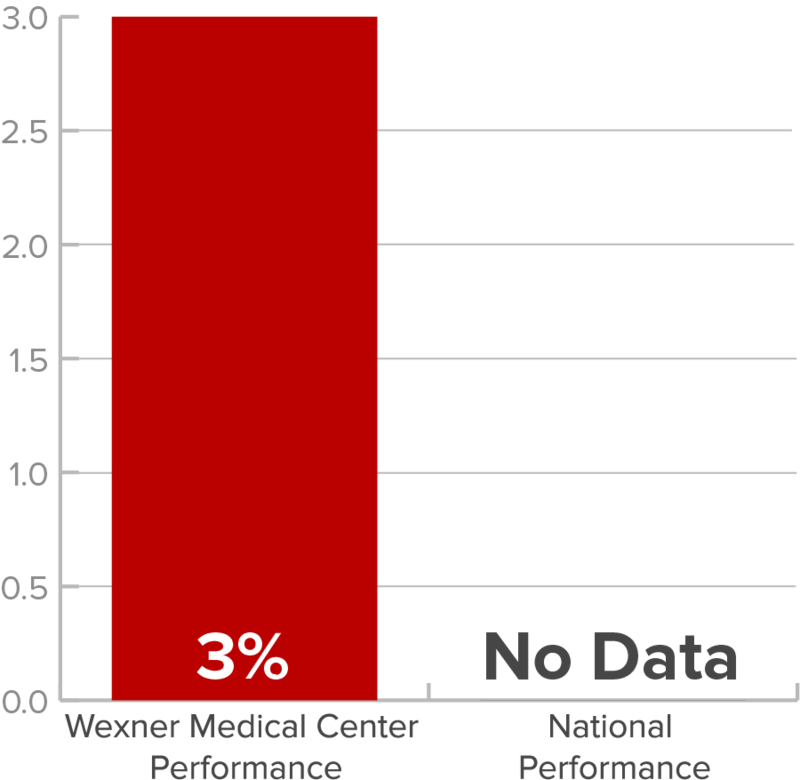 Hospital Acquired Potentially-Preventable Venous Thromboembolism 3% 2% Patients who developed a blood clot while in the hospital who did not get treatment that could have prevented it. 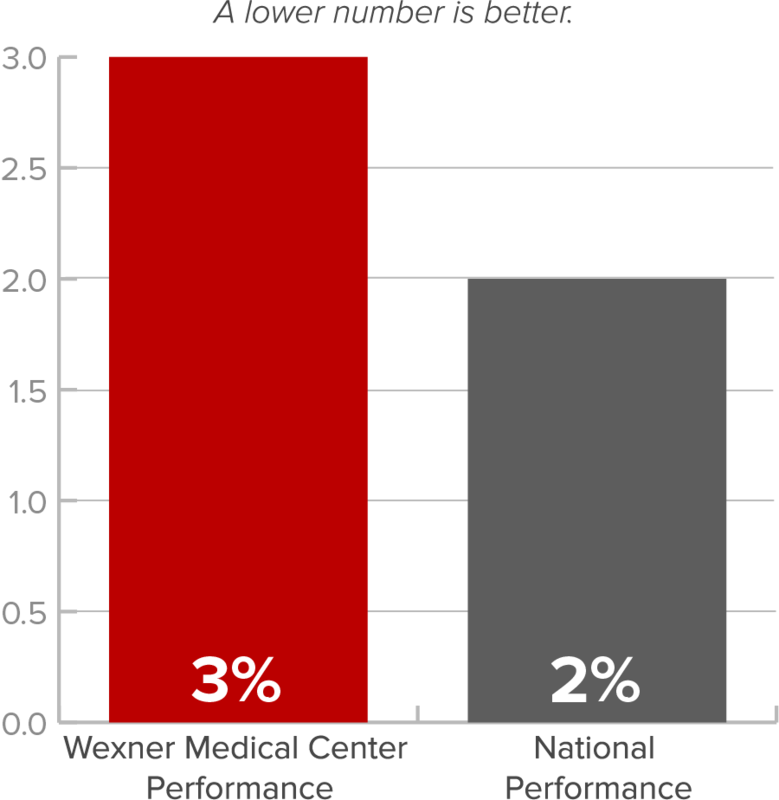 Elective Delivery Prior to 39 Completed Weeks Gestation 0% 2% Percent of mothers whose deliveries were scheduled too early (1-2 weeks early), when a scheduled delivery was not medically necessary. 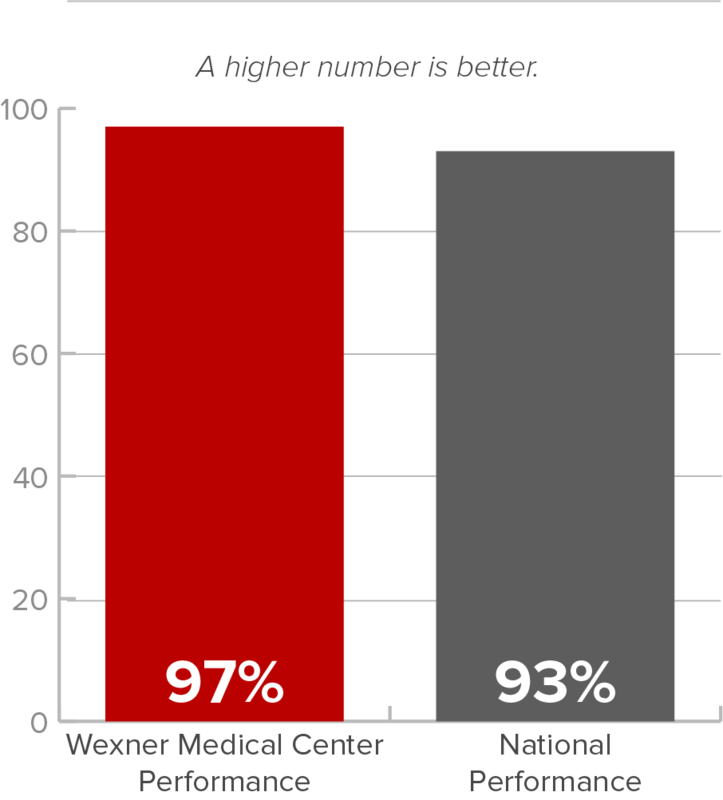 Influenza Immunization 88% 93% The immunization measure looks at how often patients who visit the hospital are offered a flu shot. 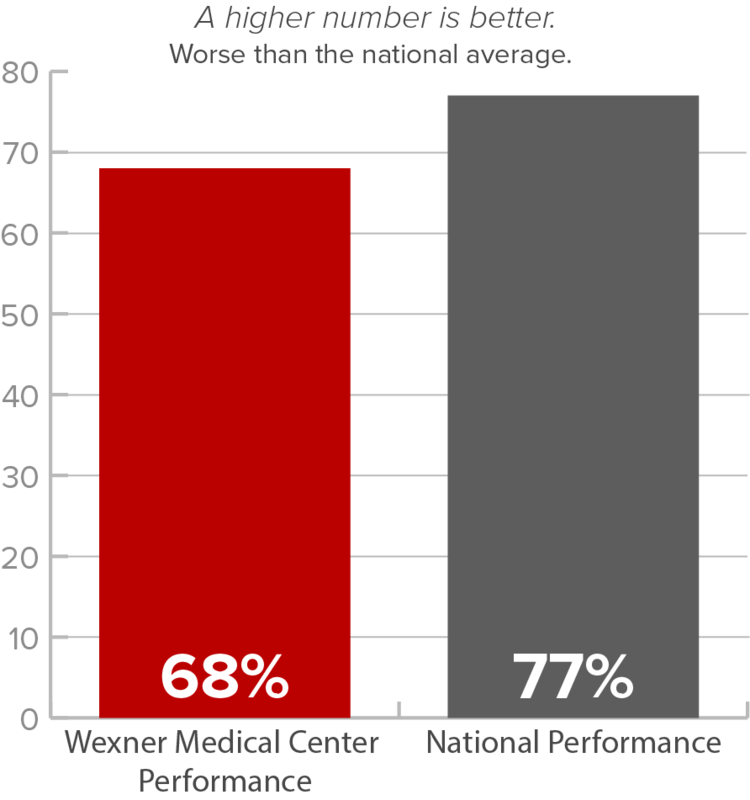 We perform at a rate slightly higher than the national average. Influenza Vaccination Coverage among Healthcare Personnel 94% 88% When our staff is immunized against illnesses like the flu, our patients are better protected, too. 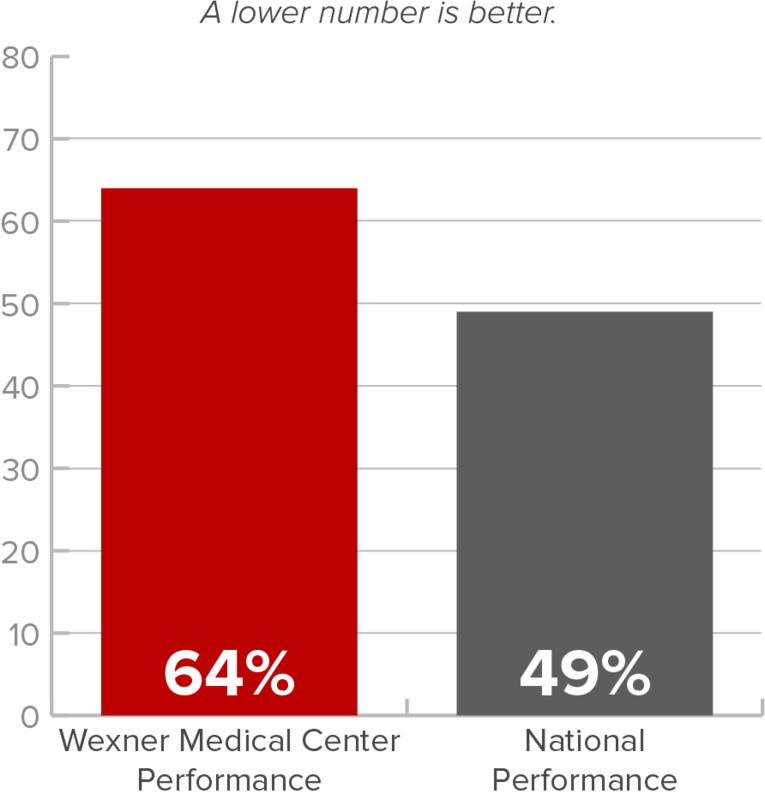 Our staff has a higher rate of being vaccinated than the national average. 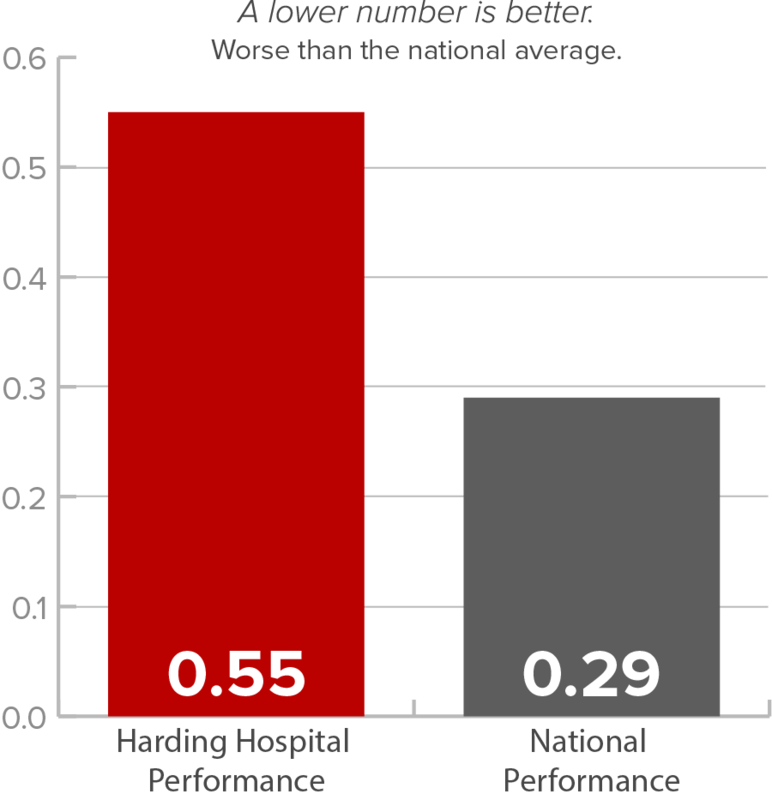 Median Time (in Minutes) from ED Arrival to ED Departure for Admitted ED Patients 435 336 Inpatient Emergency Department (ED) Throughput measures look at the time it takes patients to receive care and be admitted to the hospital. 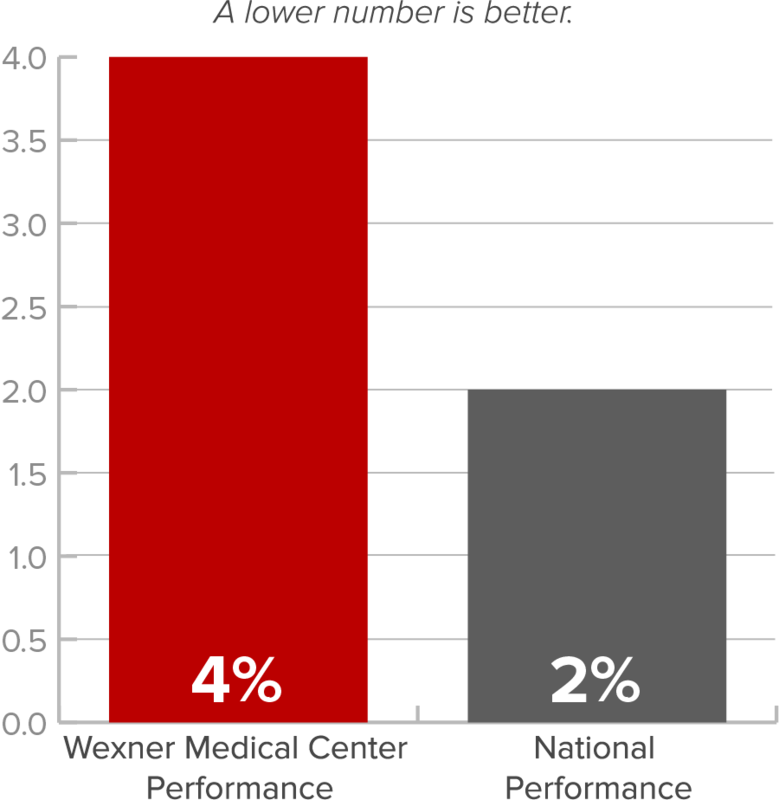 Wexner Medical Center has one of the busiest EDs in the state of Ohio. 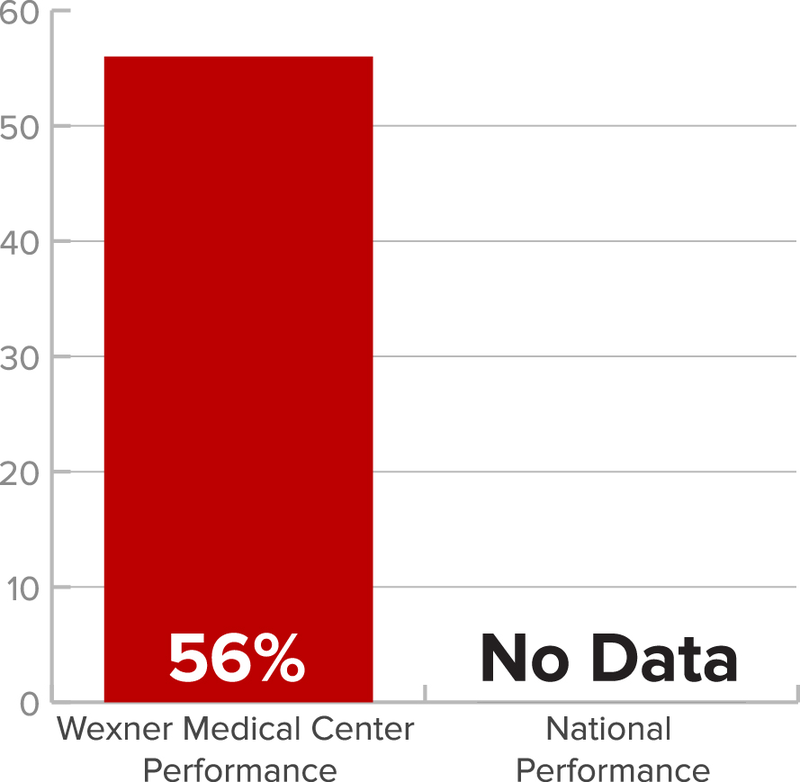 The most current data, which reflects wait times from the end of 2014 and the middle of 2015, indicates that we are performing below national standards for admitting patients from the ED. 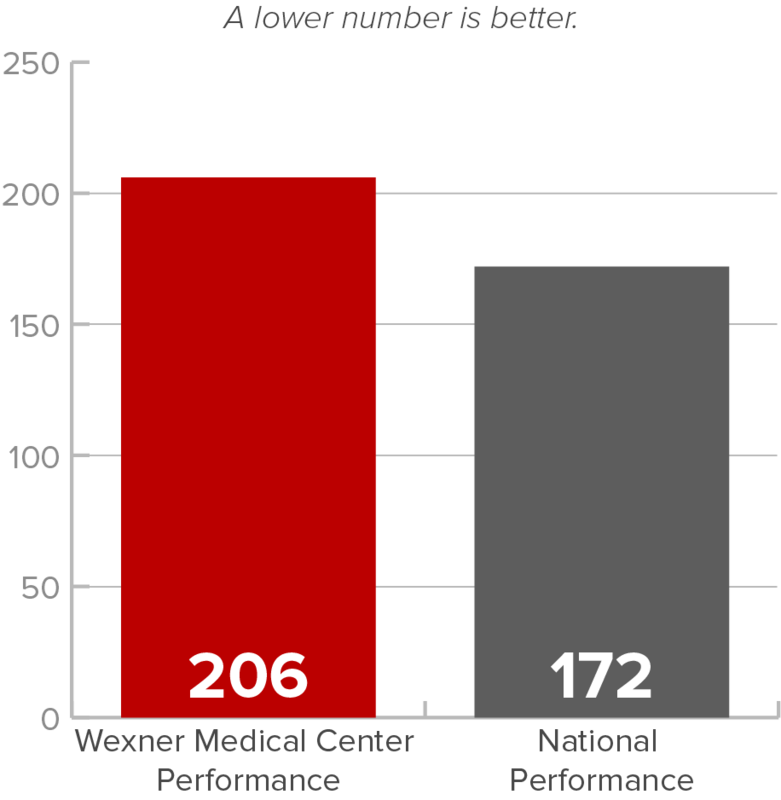 However, during that timeframe, we had just opened our expanded ED and the new James Cancer ED, so the data likely don’t reflect our performance today. We are continually working to improve our processes and reduce wait times. 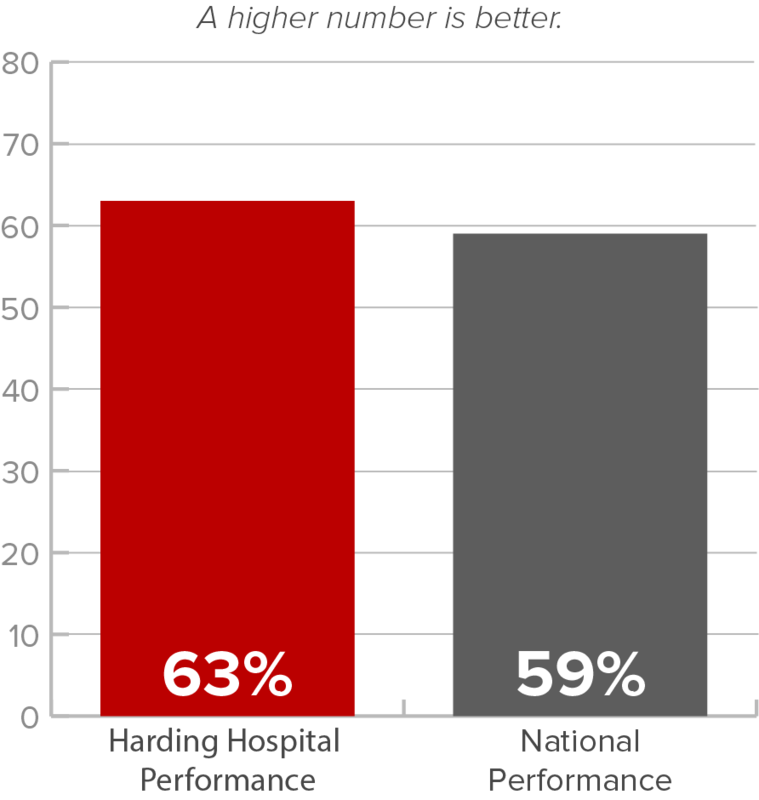 Median Time (in Minutes) from Admit Decision Time to ED Departure Time for Admitted Patients 186 137 Inpatient Emergency Department (ED) Throughput measures look at the time it takes patients to receive care and be admitted to the hospital. 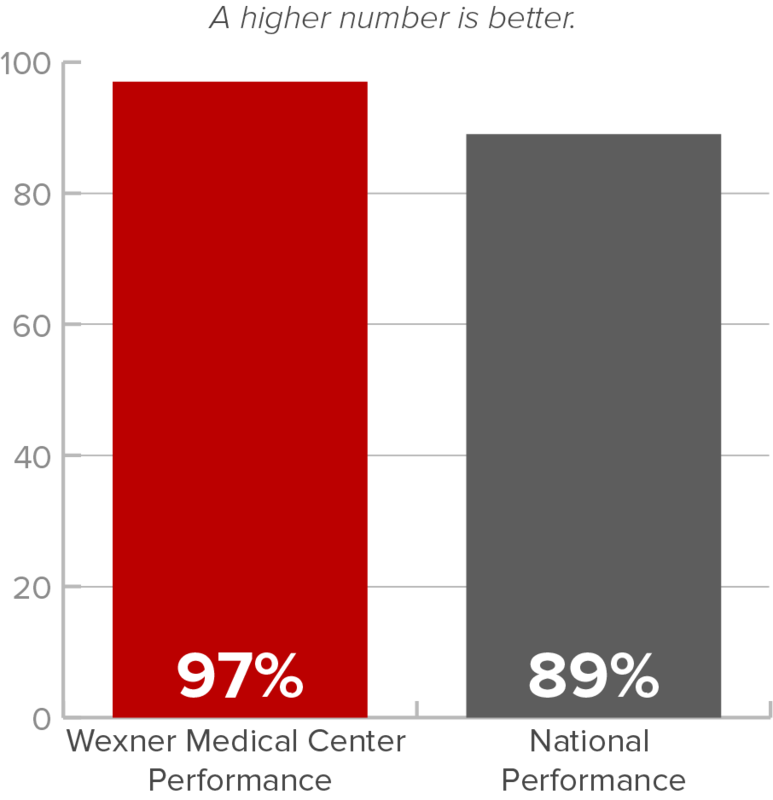 OSU Wexner Medical Center has one of the busiest EDs in the state of Ohio. 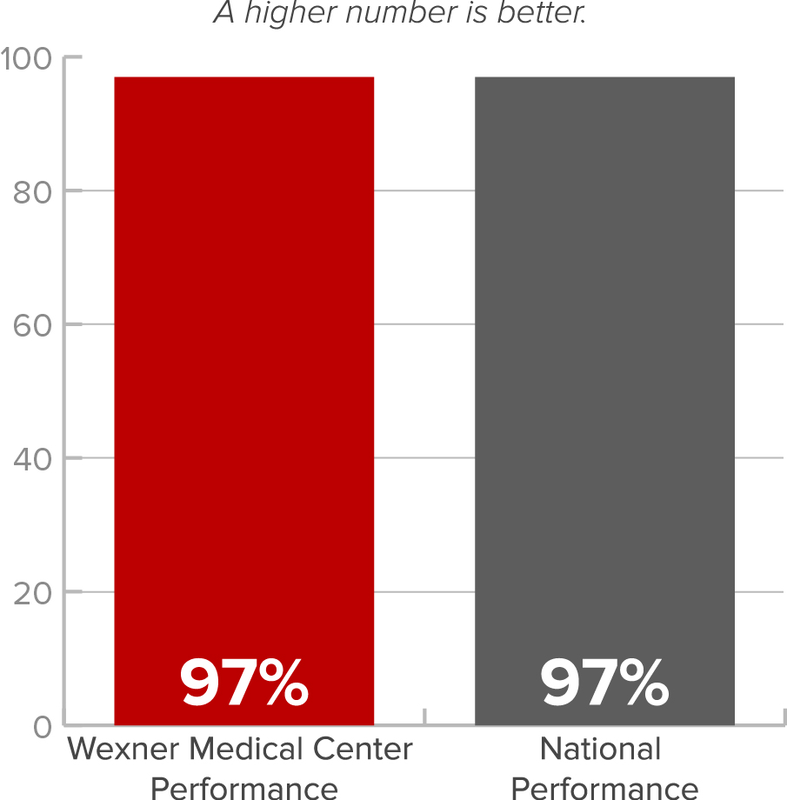 The most current data, which reflects wait times from the end of 2014 and the middle of 2015, indicates that we are performing below national standards for admitting patients from the ED. 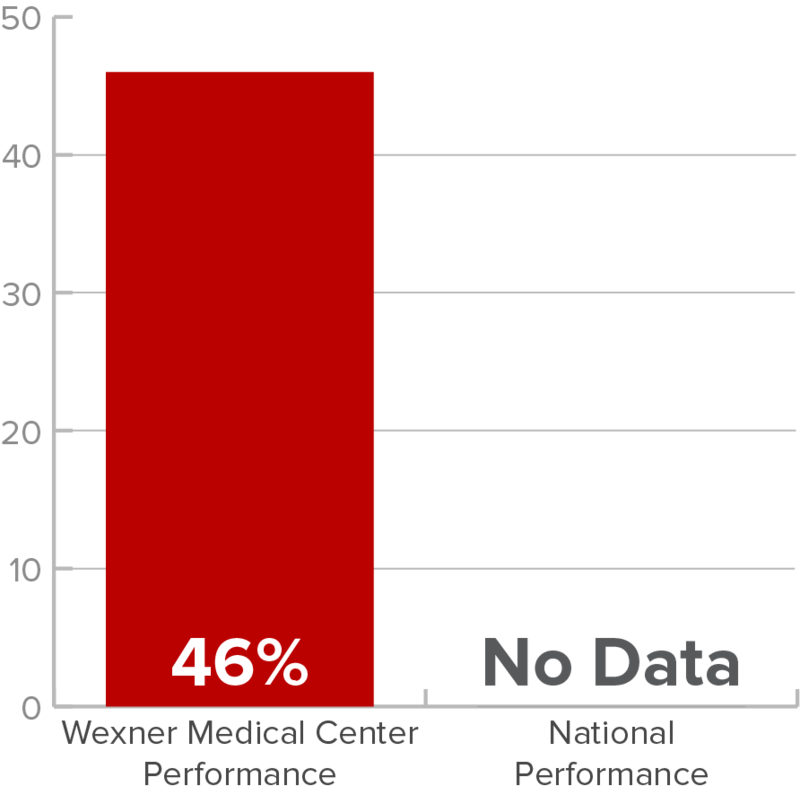 However, during that timeframe, we had just opened our expanded ED and the new James Cancer ED, so the data likely don’t reflect our performance today. We are continually working to improve our processes and reduce wait times. 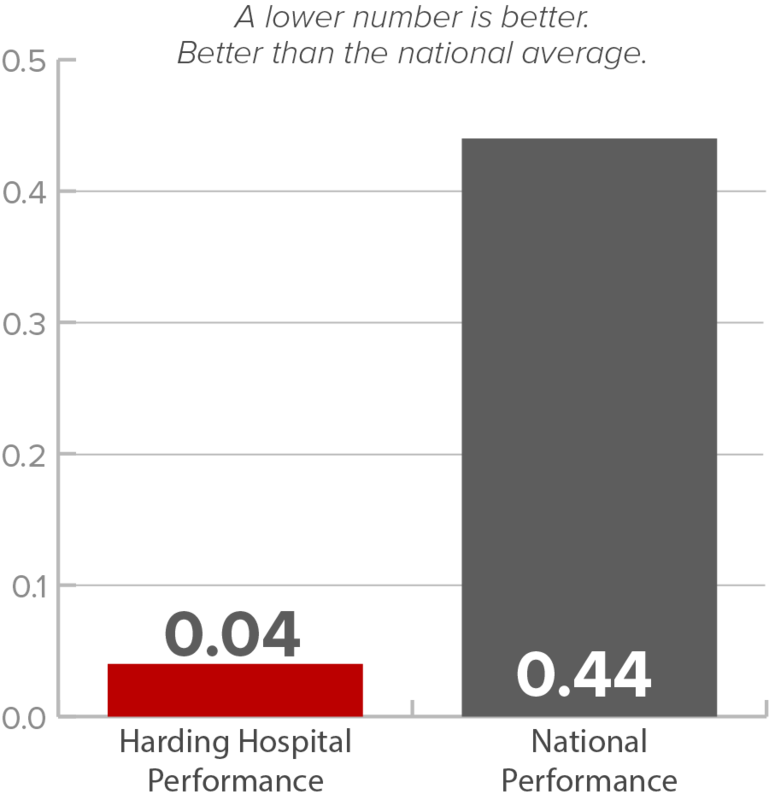 Median Time (in Minutes) from ED Arrival to ED Departure for Discharged ED Patients 206 172 Inpatient Emergency Department (ED) Throughput measures look at the time it takes patients to receive care and be admitted to the hospital. 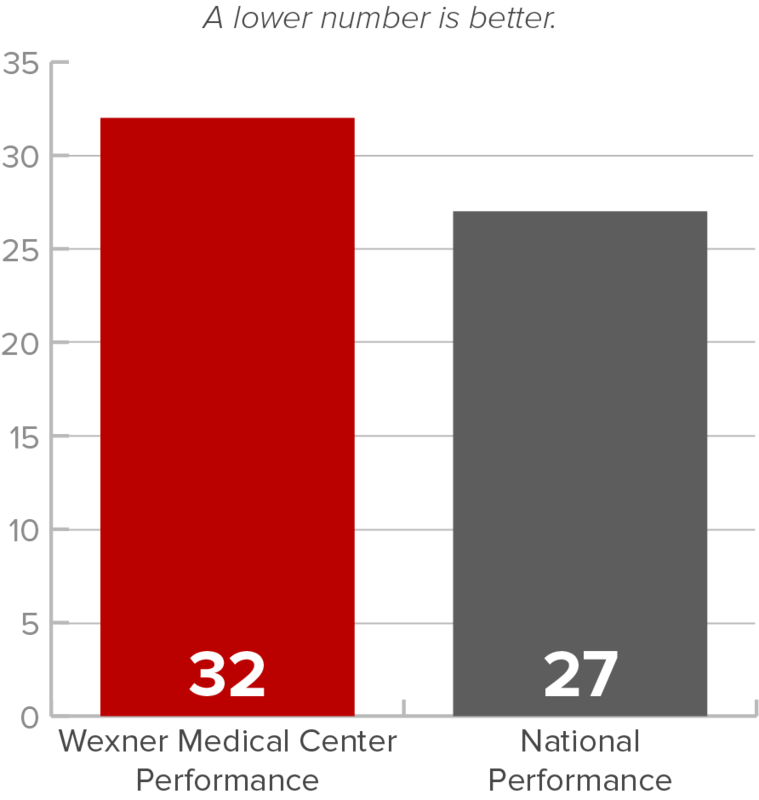 Wexner Medical Center has one of the busiest EDs in the state of Ohio. 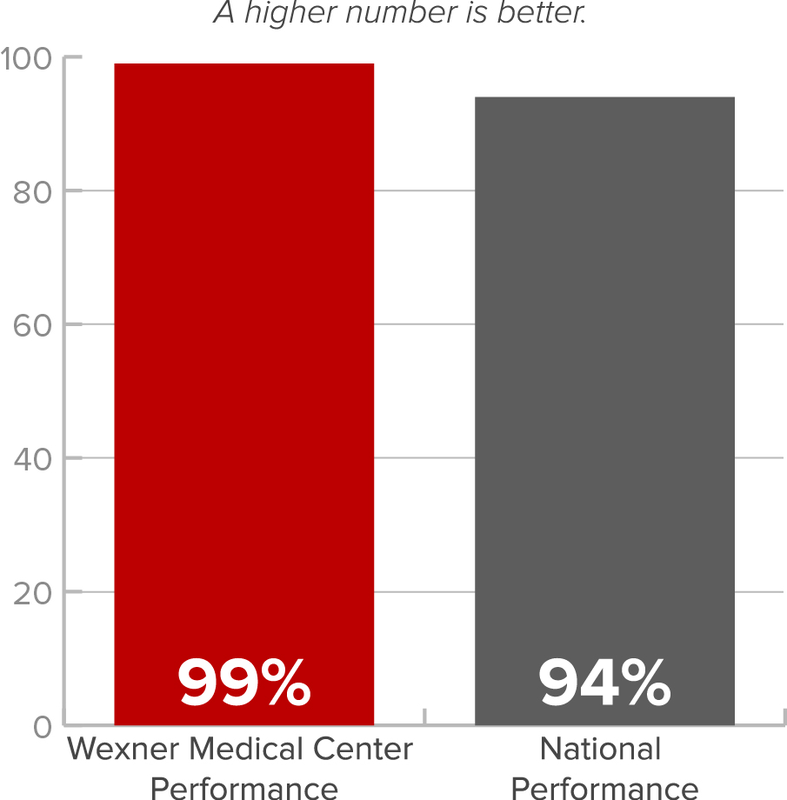 The most current data, which reflects wait times from the end of 2014 and the middle of 2015, indicates that we are performing below national standards for admitting patients from the ED. However, during that timeframe, we had just opened our expanded ED and the new James Cancer ED, so the data likely don’t reflect our performance today. 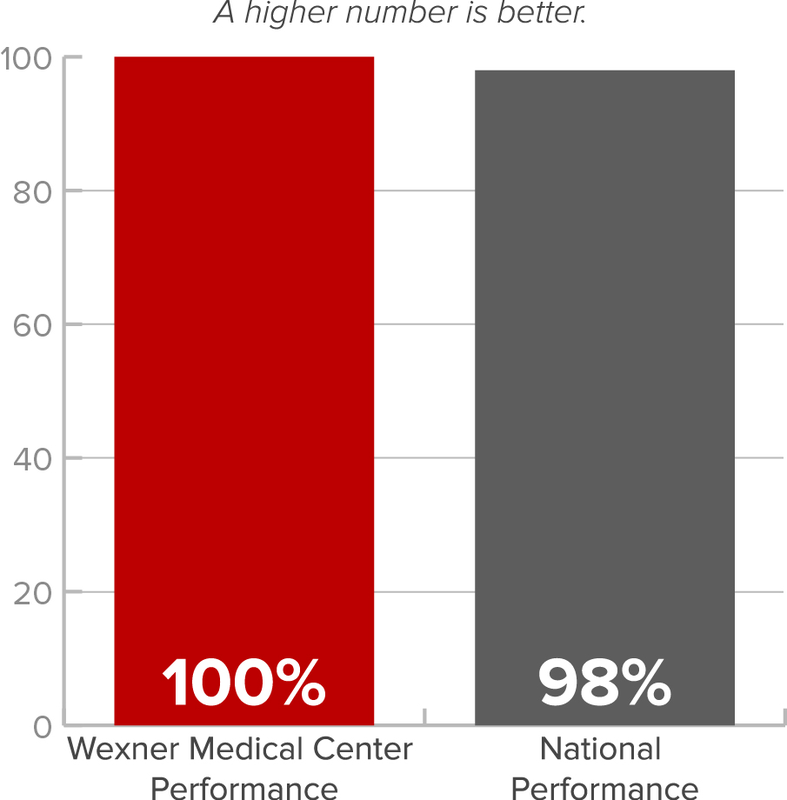 We are continually working to improve our processes and reduce wait times. 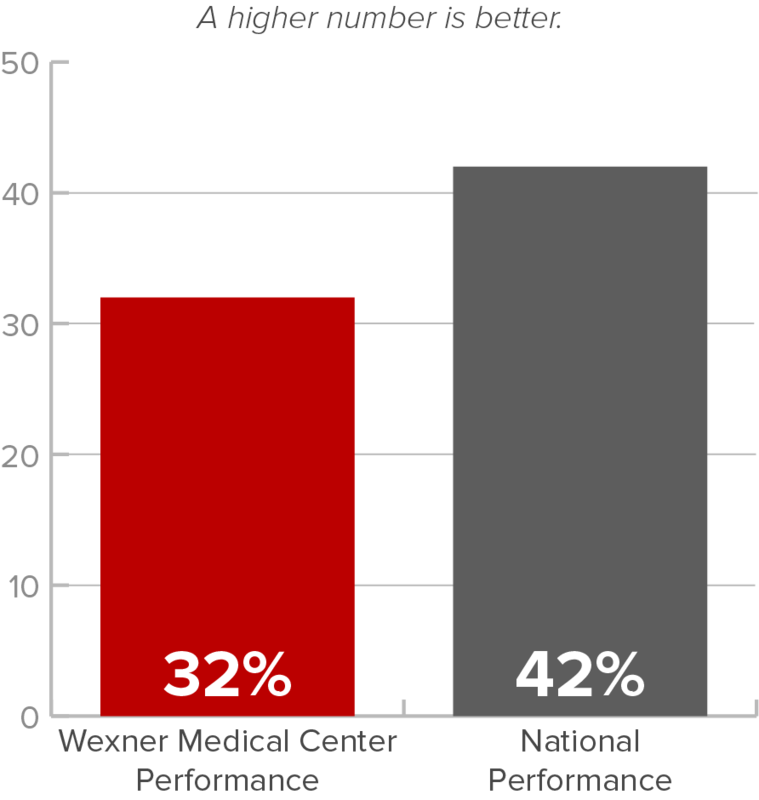 Median Time from ED Arrival to Provider Contact for ED patients 32 27 Inpatient Emergency Department (ED) Throughput measures look at the time it takes patients to receive care and be admitted to the hospital. 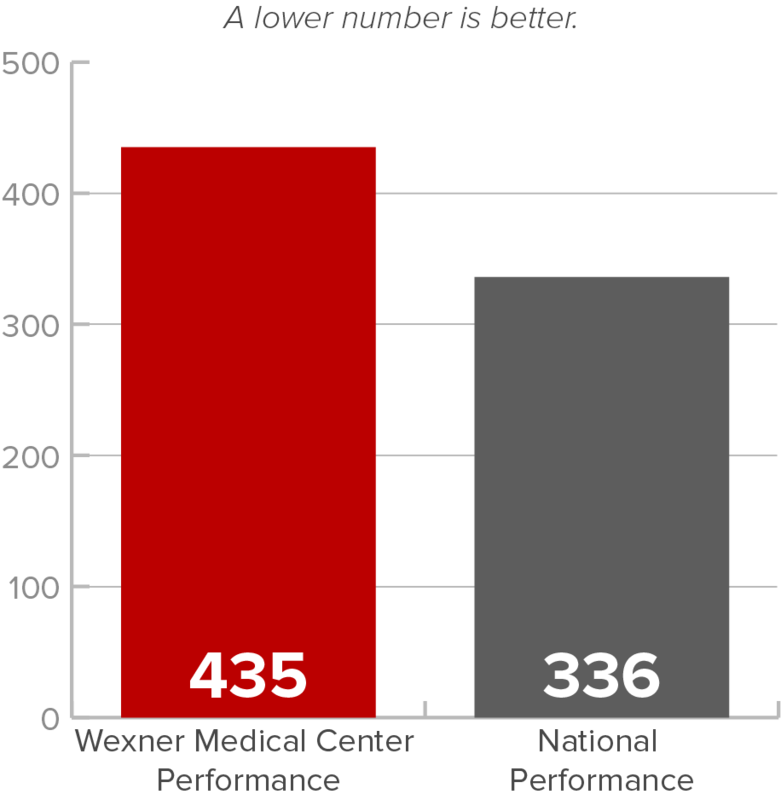 OSU Wexner Medical Center has one of the busiest EDs in the state of Ohio. 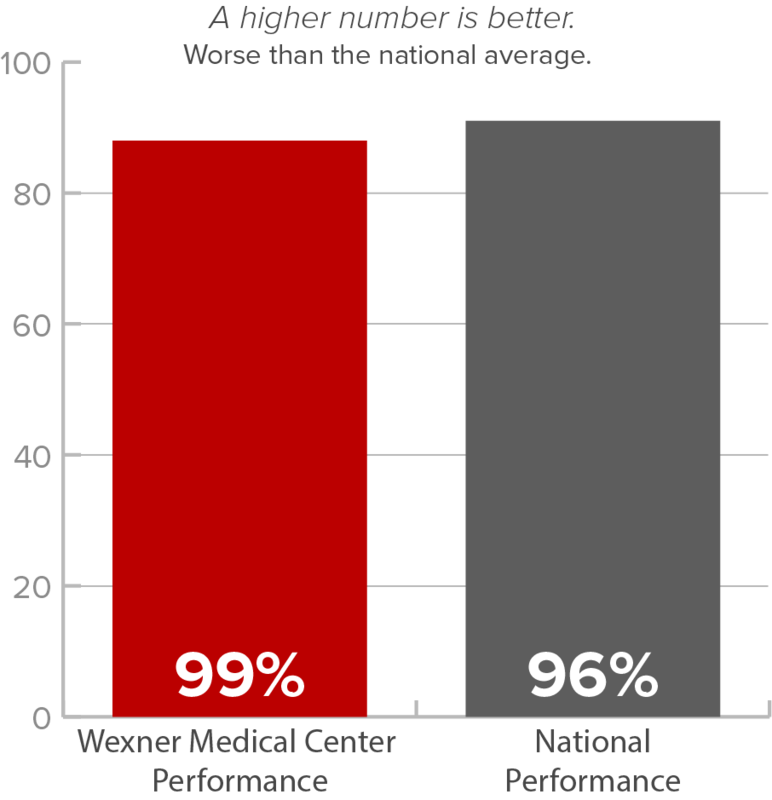 The most current data, which reflects wait times from the end of 2014 and themiddle of 2015, indicates that we are performing below national standards for admitting patients from the ED. However, during that timeframe, we had just opened our expanded ED and the new James Cancer ED, so the data likely don’t reflect our performance today. We are continually working to improve our processes and reduce wait times. 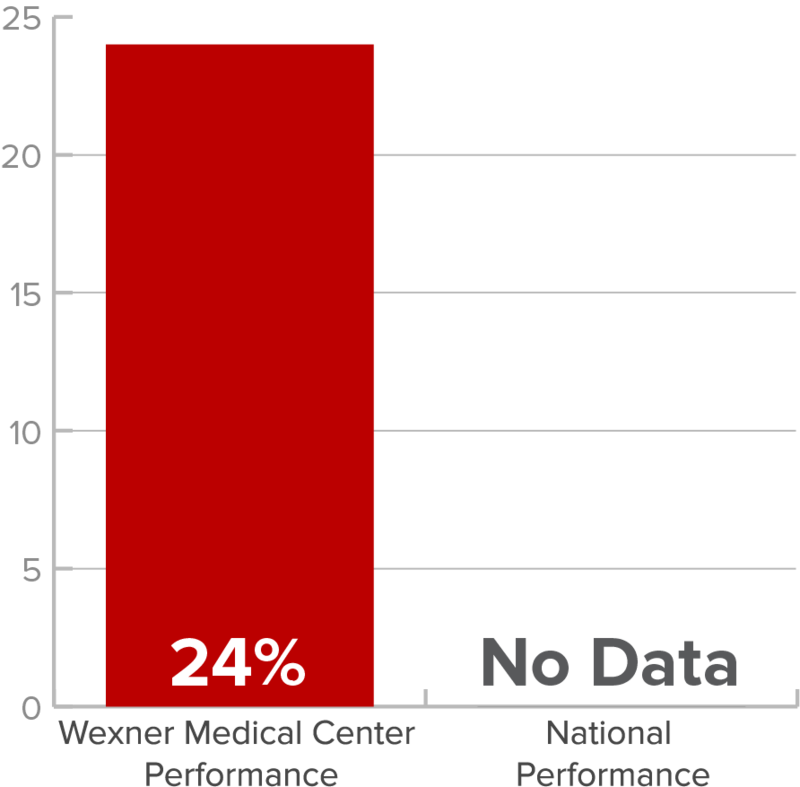 Left Without Being Seen 4% 2% Inpatient Emergency Department (ED) Throughput measures look at the time it takes patients to receive care and be admitted to the hospital. 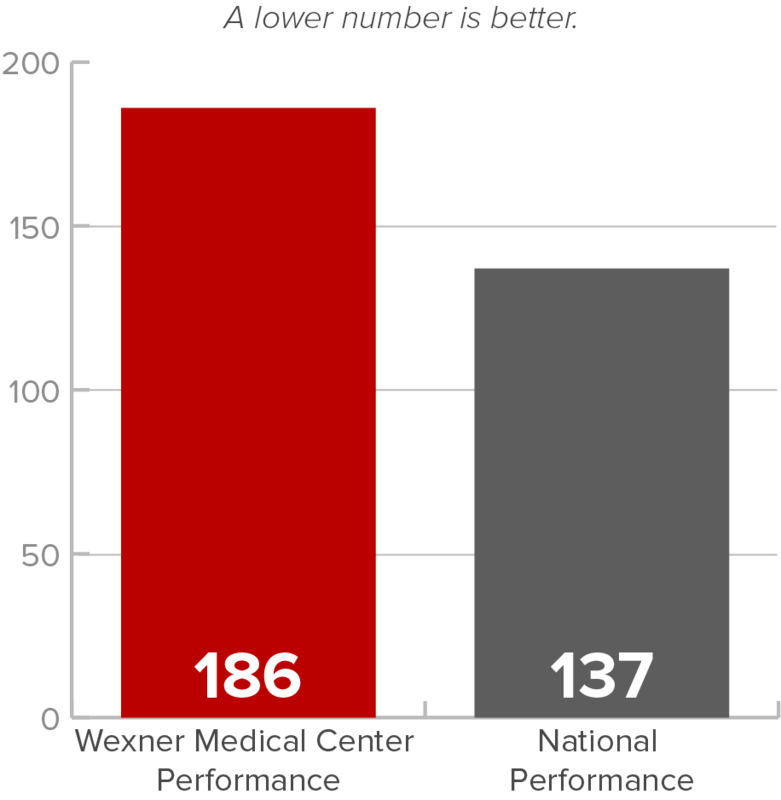 OSU Wexner Medical Center has one of the busiest EDs in the state of Ohio. 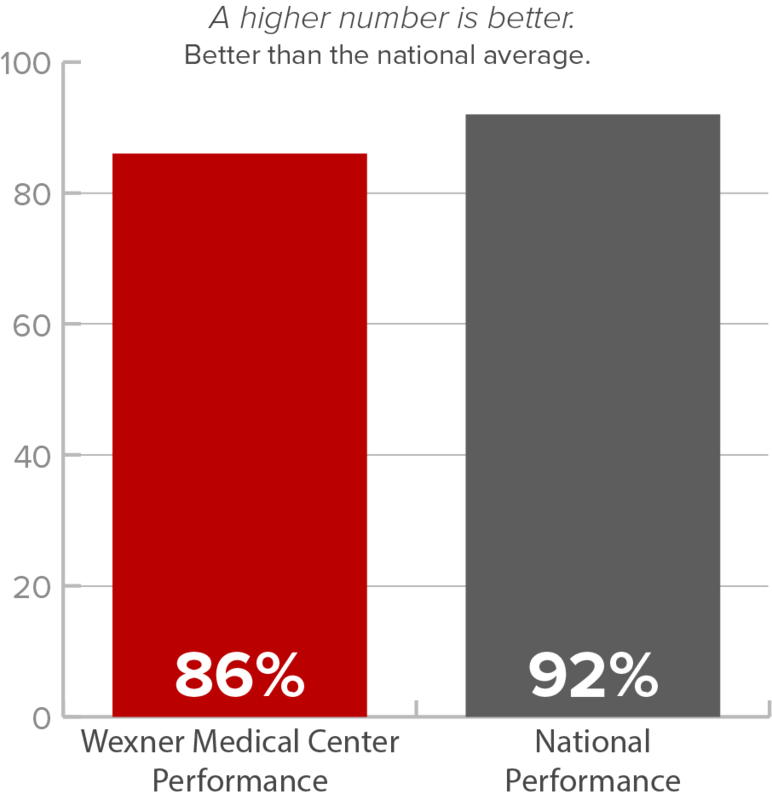 The most current data, which reflects wait times from the end of 2014 and themiddle of 2015, indicates that we are performing below national standards for admitting patients from the ED. However, during that timeframe, we had just opened our expanded ED and the new James Cancer ED, so the data likely don’t reflect our performance today. We are continually working to improve our processes and reduce wait times. HBIPS-2: Hour of Physical Restraint (Rate per 1000 Patient Hours) 0.04 0.44 The use of physical restraint increases a patient's risk of physical and psychological harm. This intervention is only intended for use if a patient is in imminent danger to him/herself or others and if less restrictive interventions have failed. We outperform both state (0.25) and national benchmarks. HBIPS-3: Hours of Seclusion Use (Rate per 1000 Patient Hours) 0.55 0.29 The use of seclusion increases a patient's risk of physical and psychological harm. This intervention is only intended for use if a patient is in imminent danger to him/herself or others and if less restrictive interventions have failed. We have results greater than both state (0.35) and national benchmarks. HBIPS-5: Patient Discharged on Multiple Antipsychotic Medications wtih Appropriate Justification 63% 59% Higher rates of HBIPS-5 indicate higher quality of care because documenting reasons for assigning two or more antipsychotics suggests that careful consideration of the benefits of this course of treatment were weighed against the potential patient side effects. 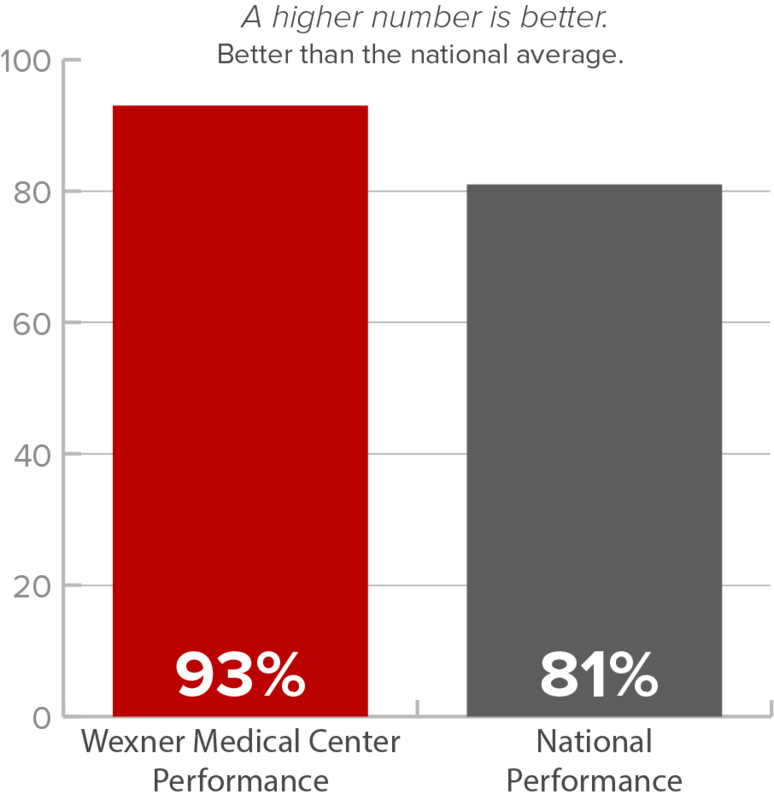 We are performing below state (68%) and national averages. This has been an area of ongoing education with physicians, residents, and NPs. SUB-1: Alcohol Use Screening 86% 92% Individuals with mental health conditions experience substance use disorders at a much higher rate than the general population. Co-occuring substance use disorders often go undiagnosed and, without treatment, contribute to a longer persistence of disorders, poorer treatment outcomes, lower rates of medication adherence, and greater impairments to functioning. We are below both state (96%) and national benchmarks. SUB-2: Alcohol Use Brief Intervention Provided or Offered 10% 70% Excessive use of alcohol and drugs has a substantial harmful impact on health and society in the United States. It is a drain on the economy, and a source of enormous personal tragedy. Clinical trials have demonstrated that brief interventions, especially prior to the onset of addiction, significantly improve health and reduce costs. SUB-2a: Alcohol Use Brief Intervention 10% 62% This rate describes only those individuals who received the brief intervention during their hospital stay. Those who refused are not included. TOB-1: Tobacco Use Screening 99% 96% Tobacco use is currently the single greatest cause of disease in the U.S., accounting for more than 435,000 deaths annually. This health issue is especially important for persons with mental illness and substance use disorders. 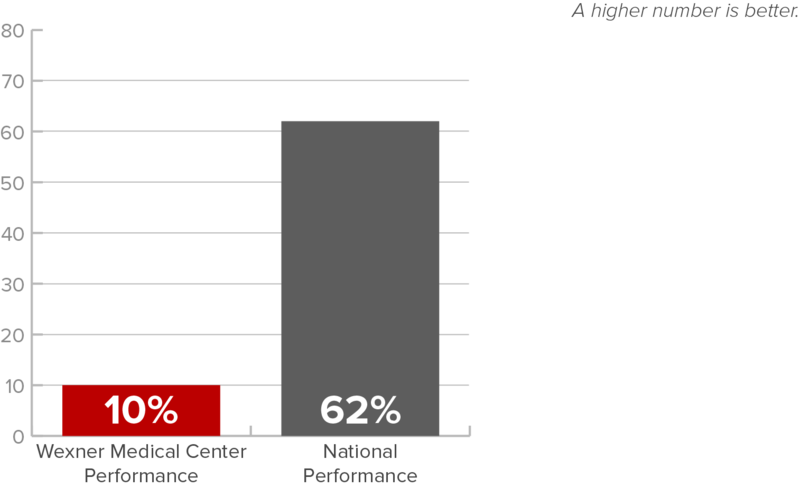 We are currently outperforming the state (96%) and national benchmarks. TOB-2 Tobacco Use Treatment Provided or Offered 68% 77% The tobacco treatment measure indicates the rate of patients to whom tobacco use treatment was offered or provided. Tobacco use accounts for more than 480,000 deaths each year. Smoking-attributable health care expenditures are estimated to be at least $130 billion per year in direct medical expenses for adults. 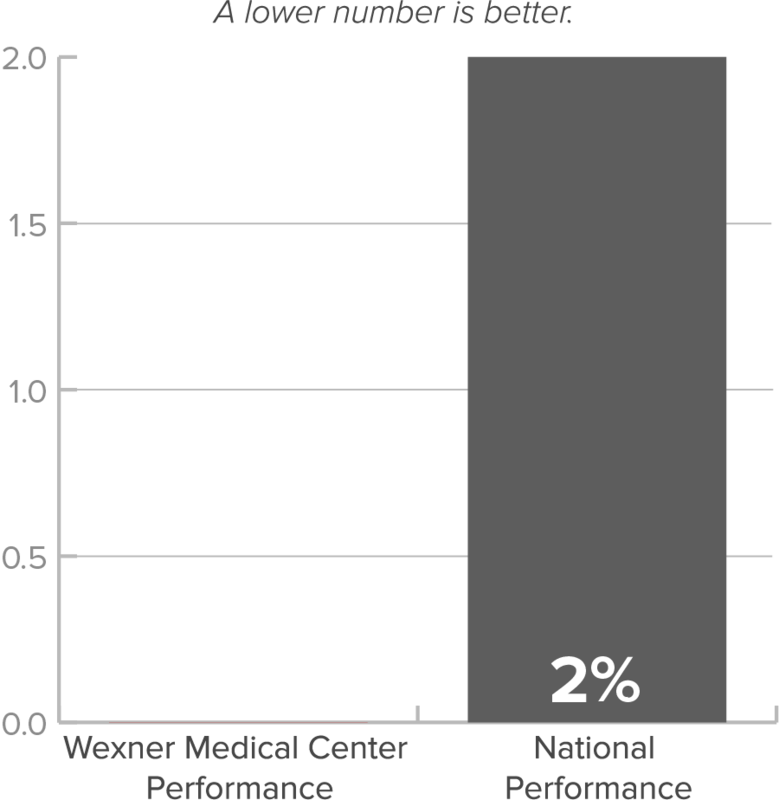 TOB-2a Tobacco Use Treatment 32% 42% This rate describes only those individuals who received the brief intervention during their hospital stay. Those who refused are not included. IMM-2: Influenza Immunization (Patient) 93% 81% Increasing influenza vaccination can reduce unnecessary hospitalizations and secondary complications, particularly among high risk populations, such as the elderly. 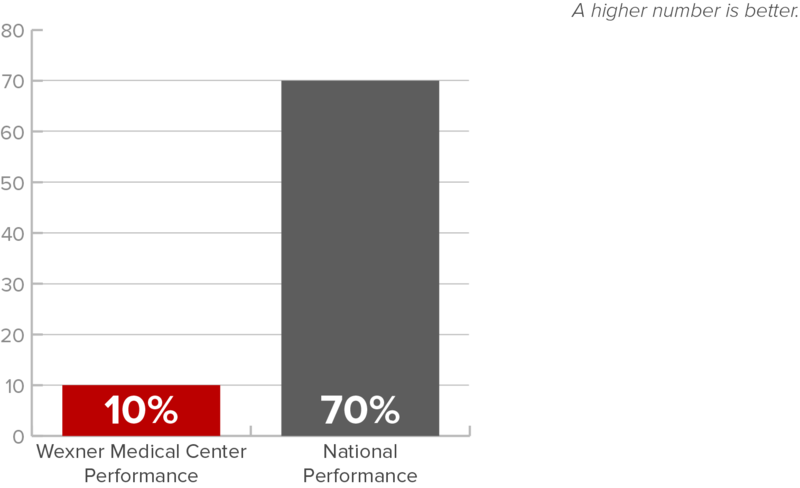 We are currently outperforming both state (80%) and national benchmarks.